Despite the common assumption that “tape doesn’t change”, it actually has changed quite a lot in recent years thanks to the proliferation of disk, and cloud storage becoming much more affordable. That’s why it’s so important that you make sure tape is the right storage media for you. 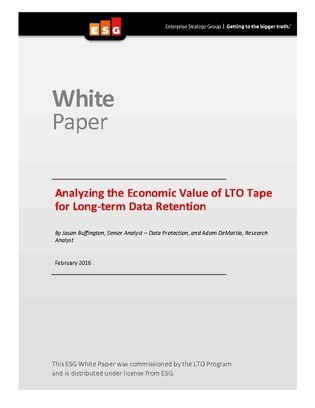 This ESG research report outlines the economic value that Linear Tape-Open (LTO)-based technology provides for long-term data retention. Click inside to evaluate TCO simulations when LTO is pitted against disk storage, as well as individual cost considerations in terms of maintenance, data migration, and more, as well as how cloud computing has impacted pricing.